If you are looking for an extremely high image quality to camera size ratio, the Canon EOS M6 may have your name on it. While the M6 is a tiny camera, it gives up nothing in terms of image quality to any of Canon's other current APS-C sensor format EOS models, including both DSLR cameras and MILCs (Mirrorless Interchangeable Lens Cameras). And, now featuring Dual Pixel AF, this camera is a great performer from this very-important image quality aspect as well. Like the rest of the EOS M models, the M6 is very well-built and Canon has packed a full set of controls into the small amount of space availed by the compact camera, making it easy to realize the image quality potential of this camera. 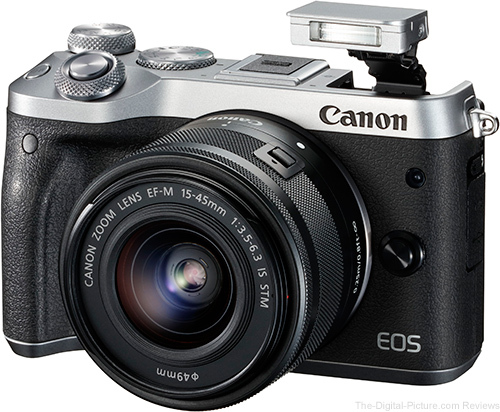 If you have read through the Canon EOS M5 Review, you will likely experience significant déjà vu while combing through the information below. There's a very good reason for that; the EOS M6 shares an almost identical feature set with the EOS M5, with the biggest differences being the M5's built-in Electronic Viewfinder (EVF) and the increased size/weight required to incorporate the M5's EVF feature. As you can see from the short list of differences above, most of the content I created for the M5 review directly applies to the M6. 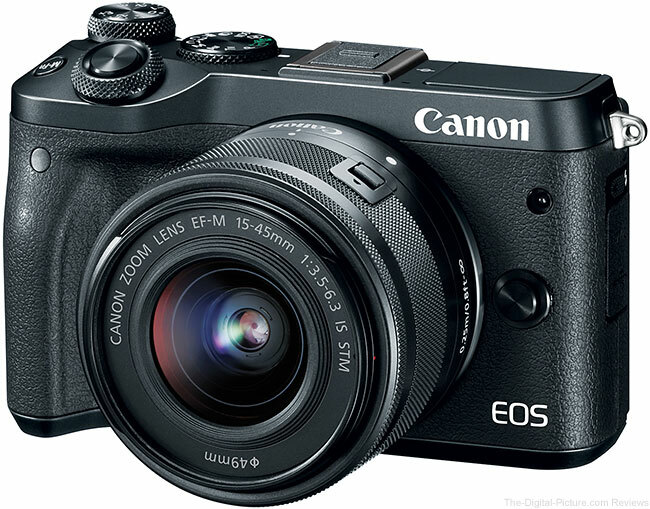 When Canon introduced their first mirrorless ILC, the EOS M model, we had the great Canon DSLR image quality we have grown to love in a tiny camera body. While the M's image quality per square inch (cm) and per lb (g) was a home run and that nearly all of Canon's entire lineup of DSLR accessories were available for it was another, there were some aspects of this camera that left many of us wanting more. I purchased and still own an M.
Subsequently, an M2 model became available in some locales and the EOS M3 was (eventually) released globally. The M3 brought about some welcomed changes, including multiple dials on the top making some settings changes easier and faster, an improved AF system, a tilting LCD, a built-in flash and a better grip. Canon offered me an M3 for long term loan just prior to leaving for a photo trip in Alaska, and I used it a good amount there and in many other locations since that trip. It packs very compactly and delivers excellent image quality. While the improvements were quite positive, I still struggled with it in some aspects. Even though faster-focusing than the EOS M, the M3 still seemed a bit slow and lacking in responsiveness. An M10 also hit the streets around the same time as the M3, though the M10 was positioned below the M3. The Canon EOS M6 features many upgrades that make it a compelling choice for those wanting DSLR-like capabilities and functionality in a smaller body. It was only a matter of time before Canon's excellent, fast, imaging-sensor-based phase-detection AF system – Dual Pixel CMOS AF (DPAF) – made its way to the M series. In addition to DPAF, a DIGIC 7 processor enables 7 fps high-speed continuous shooting which exceeds the capabilities of many full-sized DSLRs. I'll add more improvements to this list throughout the review, but ... this camera is definitely worth taking a closer look at. I often discuss the product name at the beginning of a camera review, trying to help readers better understand the lineup available to them. Unfortunately, the EOS M naming convention is moderately complicated at this time. "EOS" of course refers to Canon's interchangeable lens camera models and the "M" line refers to the mirrorless variants. However, beyond the "M" is where the naming convention trouble starts. The "M2" and "M3" came in succession. To this point, it appeared that number would simply be incremented and higher numbers were better. I can follow that. 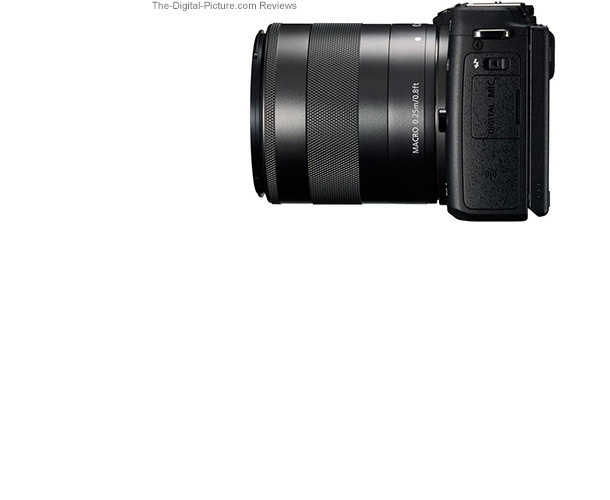 Then came the "M5" and "M10", which could still make sense if the "M5" was not the higher-end camera model. Then, not long after these two models came the "M6". I am told that, among the current models, lower numbers represent higher-end cameras. Perhaps I'm missing something obvious here, but ... a good product naming scheme should be a high priority for a marketing team ... unless confusion is actually helpful in this market. There seems to have been some foresight missing in the released-to-date M model naming conventions (or lack of). Following is a chart that shows several sensor specifications for many of Canon's recent DSLR offerings. 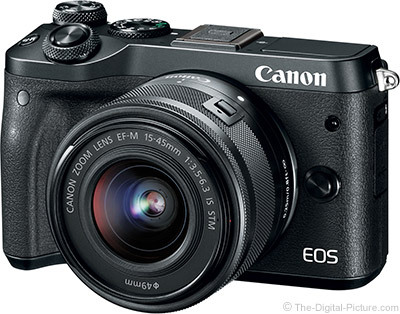 View the full Canon EOS M5 specifications to compare additional cameras. I expected that the image quality results for the EOS M6 (and EOS M5) were going to be cut and pasted from the 80D review because, basically, the same technology is found in both. While the results from the 80D and EOS M5 are indeed basically the same, the results with the same processing settings are not quite identical. I'll circle back to this point, but the bottom line is that I expected the M6's results to mirror the M5's and they do. The EOS M6, like all of the other EOS M-series cameras, features an APS-C (1.6x) sized sensor. EOS M cameras natively mount EF-M lenses and, with an EF-EOS M Adapter, all of Canon's EF-S, EF, TS-E and MP-E series lenses become compatible. Note that, as with all APS-C format cameras, a selected lens' focal length will frame a scene similar to that of a 1.6x longer focal length mounted on a full frame sensor camera (including when using EF-M and APS-C-only lenses such as the EF-S series). Obviously, the APS-C format is huge relative to the size of the imaging sensors in mobile phones and point-and-shoot variety cameras. Image quality, especially in low light, is a huge advantage they bring. The difference is dramatic. You will notice that many of the current model APS-C DSLRs share identical sensor specs, perhaps most notably the 24.2 megapixel resolution figure. Twenty-four megapixels has become Canon's APS-C standard issue at this time and this resolution is very high (higher than in many of Canon's full frame models to date). There is, however, more than one variation of 24.2 mp imaging sensors found in these cameras. 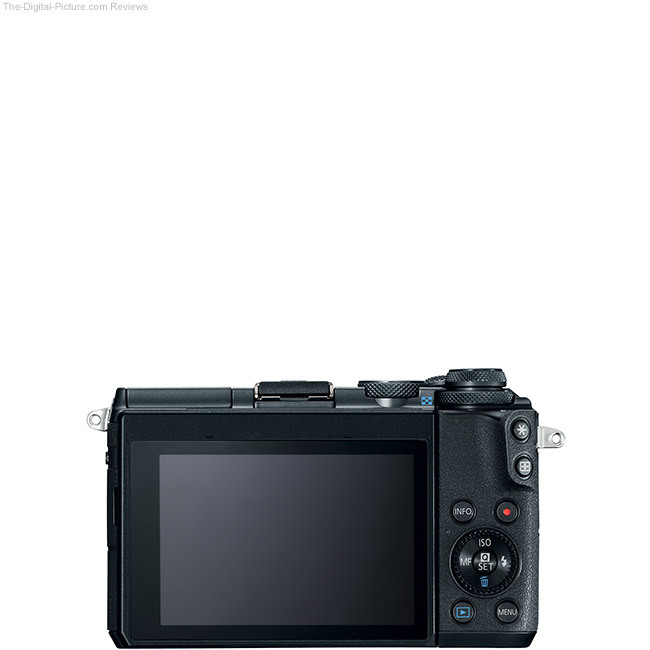 While the EOS M3 shares this megapixel count, it does not have the Dual Pixel AF feature found in the M6 and some of the other models, so there is an obvious difference among these imaging sensors. To be specific, the M6 inherits the excellent imaging sensor found in the EOS 80D (shared also by the 77D, T7i and M5). Having an identical imaging sensor, my expectation was that the M6 would produce identical results to the EOS M5 and that expectation was met. Even though the M6 inherited the 80D's sensor, there is a difference in sharpness showing in the EOS M6 vs. 80D comparison. The 80D image, processed identically to the M6 image, is slightly sharper. Hold onto that thought – I'll come back to it soon. This is a good time to build your own camera resolution comparisons. Use one of the just-provided links referencing tests from the Canon EF 200mm f/2L IS USM Lens (with some older camera models are represented by the Canon EF 200mm f/2.8L II USM Lens) to select other comparison cameras (I suggest using f/5.6 for the aperture). With APS-C 24.2 mp imaging sensors having a 3.7µm pixel pitch, diffraction begins impacting sharpness when apertures narrower than f/6.0 are selected. Results at f/8 begin to show very modest softening and at f/11, you are going to see the difference in your images. This is not to say that you should not use f/11, but you should be aware of the penalty being paid for using narrower apertures and be discerning with your exposure choices. Use the tool to learn how diffraction affects sharpness and you will be prepared to make an educated decision in the field. Another consideration for the use of cameras with pixel-dense sensors is the shutter speed required to stop camera or subject motion. Because the pixel density in camera sensors has been increasing over the years, blur and a loss of pixel-level sharpness are increasingly likely due to camera and subject motion causing subject details to cross over pixels at a faster rate on the more-dense sensors. That is unless a faster minimum shutter speed is used for handholding (image stabilization also plays an important role) and for photographing fast-moving subjects. The old 1/(focal length * 1.6) rule to determine one's shortest shutter speed for handholding an APS-C camera (without the aid of image stabilization) may not be adequate for everyone. While this formula uses the easy-to-use 1.6 factor that matches the APS-C sensor angle of view difference, the pixel density of the imaging sensor is the real reason the faster speed has been needed. You may prefer to use the 1/(focal length * 2) as a better base estimate for handholding the M6. A nice sharpness-aiding feature of mirrorless cameras is ... the lack of a mirror, eliminating that potential source of vibration. Another consideration for getting the most from a high resolution camera is the quality of the lens placed in front of it. Increased resolution will magnify any lens aberrations present. As always, the better the lens, the better the image quality. Increase resolution without any other technological improvements and noise increase is to be expected. Fortunately, gains continue to be made in this regard and the 80D results were slightly improved over its lower resolution 70D predecessor. With the same imaging sensor as the 80D, I expected no change in noise levels in M6 images. I would say that expectation was slightly exceeded, though this determination depends on one's preference for grain. 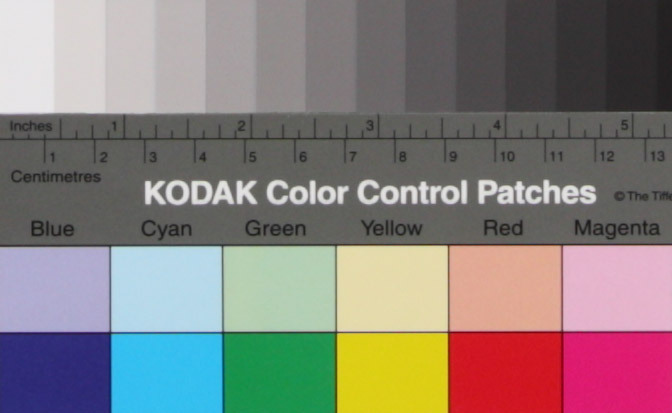 The Kodak Color Control Patches shown in the standard ISO noise test results are generated from RAW images with (this is a key) no noise reduction (unless specifically indicated by the result set). These evenly-colored patches are brutal on sensor noise, making it readily apparent when it exists. Keep in mind that many real world subjects are more detailed and better hide noise – these samples represent a worst-case scenario. Ctrl-click on the previous link to open the M6 vs. 80D comparison in a new tab. At ISO 3200, the differences are noticeable. The 80D's results have a grainier but sharper appearance while the M6 (and M5) has a smoother, softer appearance. There is an entire algorithm-filled imaging pipeline involved in the capture of photons ending up in a final converted image. While we can't change what is captured in the RAW file, RAW converters can be adjusted to help minimize inconsistencies between cameras or to simply enhance the output at the photographer's discretion. The 80D's results appear sharper in the site's image quality tool and the grainier 80D results seen in the noise test indicate increased sharpening being applied at the standard processing settings (sharpness set to a very low "1" in Canon's Digital Photo Professional). Changing the sharpness setting is simple and, with a setting of "2", we see the M5 (same as M6) noise looking very similar to the 80D noise. Change the sharpness to "3" and the M5/M6 results appear slightly grainier than the 80D results. So, if the M6/M5's sharpness setting is adjusted to visually match the 80D's results, these three cameras deliver essentially the same image quality. Many additional comparisons are available in the noise tool. Find the camera you are familiar with and compare it to the M6. Unless it was a recently introduced model, you will not likely find an APS-C model matching the M6, especially at high ISO settings. Digging into the noise a bit deeper: as the ISO setting increases, noise becomes more apparent. This is and always has been the rule. How apparent the difference is between camera models is indeed the big question. If you can't see the difference in the provided standard ISO noise tests, you will not likely discern it in your images either. The M6's ISO 100 results are very clean – this is the norm for EOS cameras. Noise levels steadily increase as higher ISO settings are used until I reach my personal tolerance for noise at ISO 3200. Results at ISO 6400 are noisy, but they can be usable. More of a last resort is ISO 12800 and a significant percentage of the details get lost due to the low signal-to-noise ratio at ISO 25600. A set of Canon Digital Photo Pro default noise reduction results for the M6 are included in the tool and noise reduction is available in a variety of strengths in-camera or during post processing. Noise reduction can make a big improvement in noise levels, but the tradeoff is destruction of image details and reduced sharpness. I typically use no noise reduction for low ISO-captured images and a low amount for higher ISO-captured images. Like the amount of sharpness selected, you can adjust noise reduction to your personal preference. The M6 also has Multi Shot Noise Reduction available. MSNR merges information from multiple exposures taken in an automatic max-frame-rate burst into a reduced noise image. While MSNR shows great improvement (roughly 2 stops at higher ISO settings), it has limited usefulness in real world shooting. The downsides to Multi-Shot Noise Reduction include: MSNR is currently available only with JPG output (I would like to see this feature added to Canon's Digital Photo Pro software for RAW capture processing – perhaps as another HDR preset). Multi-Shot Noise Reduction is not so useful with moving subjects (or with a moving camera). Long exposure NR, Dust Delete Data, Multiple Exposure and HDR Mode must be set to off to enable MSNR. The M6 reverts back to Standard NR in Auto/Basic zone modes, during video recording and in Bulb mode. Flash is not supported in MSNR mode. After the multi-shot burst is captured, the camera remains "busy" for a period of time while processing the merged image. So, while this feature is a nice idea, its limitations make it less useful in real-world applications. I am far more likely to use a low ISO setting with a longer exposure when shooting stationary subjects from a tripod. From a dynamic range perspective, performance is similar to the 80D, Canon's best APS-C model to date. The M6 has proven that those longing for reduced size and weight need not sacrifice image quality to gain those desirable traits. The M6's image quality results mirror the M5's and that is very good. Canon RAW file sizes increase with: 1. Resolution 2. Bit Depth (14-bit is better/larger) 3. Detail (noise adds detail, so high ISO file sizes increase). Memory and disk are cheap - buy more. High resolution images create large files, especially when captured in (strongly recommended) RAW format (vs. JPG). The Canon EOS M6 writes image files to an SD/SDHC/SDXC (UHS-I) memory card. For an ISO 100 image, you can estimate roughly 1.3MB in RAW file size per megapixel of resolution (the M6's file size slightly exceeds that estimate). Fortunately, memory cards have become so inexpensive that large files sizes are a minor problem. Buy plenty of capacity and multiple cards. I recommend rotating memory cards to maintain a backup set until, minimally, you are able to get the images safely into your formal backup strategy, one that includes off-site storage. If your computer storage is lacking hard drive space available, simply add external storage. The M6 gets a gets a significantly faster 7 fps frame rate over the M3's 4.2 rating. If your application permits One Shot AF mode, an even faster 9 fps automatically takes effect. Using a Lexar 128GB Professional 1000x UHS-II SDXC U3 Memory Card in One Shot AF mode (to get the max frame rate), the EOS M6 repeatedly captured 18 RAW frames in 1.84 seconds until filling the buffer, matching the rated drive speed. Using this card, an additional frame was captured roughly every .4 seconds after the buffer filled. The lens cap remained on for the manual focus testing (insuring a black file and the smallest file size). It should be noted that I am using a UHS-II card instead of a rated-for UHS-I card. This buffer capacity should be considered best-possible for the referenced memory card and your in-the-field results will likely vary, though the speed of the memory card should be expected to make a difference. A fast frame rate is frequently used for photographing action and photographing action frequently means tracking a subject in AI Servo AF mode, meaning that the 7 fps figure will often be realized. However, there are times when a fast frame rate can be helpful in One Shot AF mode, such as when doing HDR photography in reasonably bright lighting conditions. I say "reasonably bright" because bracketed exposures captured for HDR photography often utilize some frames with exposures long enough to push back even a slow max available frame rate. I always find it helpful to see a visual sample of a specified frame rate in use. Drag your mouse over the labels under the following image for a visual look at the 7 fps rate at an indoor track meet (using an M5). The Canon EF 70-200mm f/2.8L IS II USM Lens was used via the EF-EOS M Adapter for the above images (155mm, f/2.8, 1/800, ISO 4000). Canon has not published a shutter lag spec for the M6. With no mirror flipping up to start an exposure and with an electronic first curtain shutter (shutter sound is made at the end of the exposure), the perception (vs. reality) of the shutter lag duration is increased, but the camera responds very quickly. The M-series cameras are very quiet to use. The quietness feature is welcomed by photographers when wanting to avoid attention, such as when they are photographing wildlife or a quiet event. Following are links to MP3 files illustrating the M6's shutter sounds. Camera sounds are recorded using a Tascam DR-07mkII Portable Digital Audio Recorder with record levels set to 50% at -12db gain and positioned 1" behind the rear LCD. I have been waiting for Canon's excellent Dual Pixel AF system to make it to the M-series and with the EOS M5, it arrived. Now the same technology appears in the M6. The M6's AF system now has speed similar to Canon's conventional DSLR phase detection AF systems. It is quite fast and considerably faster than the EOS M3's AF system. 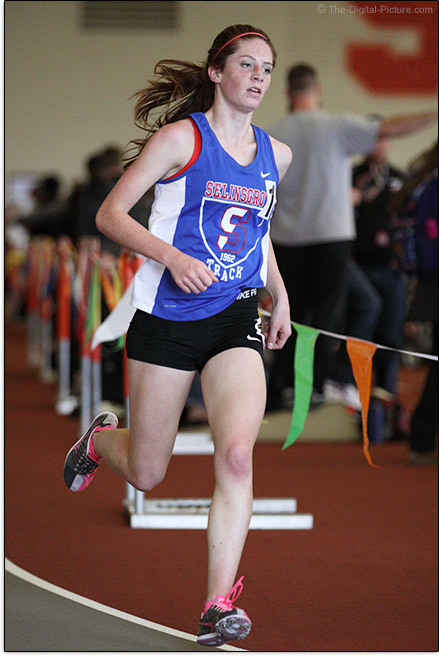 As you noticed in the frame rate example above, I photographed an indoor (low light) track meet using the M5 and 70-200 f/2.8L IS II lens combo. The AF system performed quite well in this situation. At least until the runners approached very closely (where I also had trouble following them around the turn using the electronic viewfinder), the AF system stayed locked on. I also photographed at an outdoor track meet with the M6 and EF-M 18-150mm lens and the results were also decent (though the relatively narrow aperture does not strongly challenge an AF system). AF accuracy in One Shot mode has been excellent with the M6 – getting in-focus images is easy. Live View and Movie focusing modes include what has become the Canon standard for Dual Pixel CMOS AF: Face Detection with Tracking, Smooth Zone AF (no longer FlexiZone Multi), and 1-point AF (used to be called FlexiZone Single). The AF zone covers 80% of the frame and AF is possible with max. apertures of f/11 or wider. All AF modes have worked very well with the M6, and the face detection tracking combined with the ability to influence which face is selected is especially impressive. The M6's capacitive touchscreen allows for Touch Focus during both Live View still photography and before/during video recording. Just tap your finger on the LCD where you want the camera to focus and it happens – smoothly. It's just that easy. Note that Touch & Drag AF (which debuted with the M5) was not included in the M6. With Touch & Drag AF, the entire LCD or a specific portion of it can be used as a trackpad to position the AF point during stills or video capture. By touching and dragging on the LCD, the active AF point can be very quickly repositioned, either absolutely based on the touch location within the LCD (or selected portion of the LCD) or moved relative to drag direction. Touch & Drag AF would likely have been appreciated by M6 owners who plan on using the camera with the optional EVF. With each new camera that Canon has introduced since the ground-breaking EOS 5D Mark II, creating high quality videos has become incrementally easier. The M6's video feature set builds upon its traditional DSLR and mirrorless EOS predecessors with the inclusion of Dual Pixel CMOS AF and a brand new in-camera 5-axis stabilization system (more on that later). The M6 offers video recording in .MP4 format using the MPEG-4 AVC / H.264 codec, with audio being recorded in AAC (.MP4, stereo) via its front microphone or the 3.5mm stereo input jack. Sound recording levels can be set to Auto, Manual (64 levels) or Disabled entirely. Wind Filter and Attenuator options can be set in the sound recording menu. Movie recording modes are fully automatic or manual with auto ISO and exposure compensation available for a balance of manual and automatic control. Recently introduced video features such as HDR and Creative Filter capture have been omitted from the M6, but Time-Lapse Movie creation is supported. Time-Lapse Movie mode was first introduced in the EOS 5Ds / 5Ds R and was later included in the EOS 80D. However, the time-lapse movie feature implemented in the EOS M6 is slightly different. Time-lapse movies can be created only in Movie mode and are enabled via the camera's menu system along with the time-lapse variables, scene preset, shooting interval, exposure preferences (fixed/variable) and number of shots. As you would expect, the recording session time will be dictated by the shooting interval and number of shots, but surprising is that the maximum recording time will be limited by the Shooting Scene preset specified. For instance, the max recording time with the Scene 1 preset is 1 hour, while Scene 2 and 3 allow for a max recording time of 2 hours. With the Custom Scene setting chosen, a recording time up to 7 hours is available. Sound recording is not available during Time-Lapse Movie capture. Time-lapse movies are recorded in .MP4 format at 1080p, 30 or 25fps. Movies that have been recorded can be compressed via the menu system by sacrificing frame rate and/or resolution. For instance, a Full HD 59.94p movie can be compressed to HD 29.97p. The EOS M6's ability to capture high-quality video is greatly aided by its Dual Pixel AF CMOS sensor with improved AF tracking. Also aiding video quality is Canon's newly developed in-body 5-axis image stabilization system (also found in the M5), combining in-lens optical stabilization with in-camera digital image stabilization. This system can be set to one of three settings (Enabled, Enhanced and Disabled) and can provide stabilization for non-stabilized lenses or increase the stabilization capabilities of lenses featuring traditional IS systems. Maximum stabilization is achieved using a Canon lens featuring Combination IS (at review time, only the EF-M 18–150mm f/3.5–6.3 IS STM and EF-M 15–45mm f/3.5–6.3 IS STM). In my limited tests with the M5, DPAF tracking and in-lens IS work extremely well while the digital IS feature left me unimpressed. Perhaps I just needed more time to fully figure out this feature, but ... the in-lens IS was all that I needed anyway. Overall, the EOS M6's video-specific features make it a less compelling option for videographers when compared to the other cameras such as the EOS 80D, which offers .MOV recording (in addition to .MP4), user selectable compression, Video Snapshots, more time-lapse movie options and infrared remote recording compatibility. However, the EOS M6's small size could certainly be advantageous for certain filming projects and you can expect the camera to deliver excellent video quality while making great videos quite easy to create. The EOS M line is all about delivering big camera image quality from a tiny package and next we will look closer at the physical attributes of the camera. While the original M had very few controls, subsequent models have been adding them and the M6, as of review time, is tied with the M5 for the most. The usefulness of a camera relates in part to your ability to control how it works. While the defaults for all of the provided dials and buttons are very well thought out, the M6 features a high level of programmability, making the ideal-for-you customized setup available. A large number of the M6's button and dial functions can be programmed for a different function or limited to a specific set of functions. From the back perspective, ignoring the EVF, the M6 looks very similar to the M5 and, ignoring some button function changes, also very similar to the M3. To compare the M6 with many more Canon EOS camera models, use the site's camera body comparison tool. The buttons on the back of the M6 are in excellent order, useful, well-labeled and nicely located with space remaining mostly for the LCD. The M6's Rear Control Dial has a great design including a crisp edge that is easy to grip and the directional switches within it are easy to use without much finger movement. It is not as easy to tactilely find the four flush-mounted buttons surrounding the Rear Control Dial and it is especially hard to use them with gloves on. Big on the back is always the LCD and the M6's LCD is very nice. This is Canon's excellent 3" (7.5cm) Clear View LCD II monitor, featuring capacitive touch and high resolution with approx. 1,040,000 dots. The LCD tilts 180° up and 45° down. A benefit of this type of tilting LCD (vs. the side-pivoting Vari-Angle feature found on many EOS DSLRs) is that it does not interfere with cables attached to the left side. A benefit from tilting 180° up (vs. the M5's tilting 180° down) is that a tripod does not interfere with visibility of the LCD, making this model better-suited for selfies, including both still and video recording. The LCD's touch capability provides great control over camera settings. Pinch, tap, double tap, flick, etc. gestures are supported. The M6's LCD stays surprisingly clean even with fingers frequently touching it and, when needed, a microfiber cloth simply removes any dirt/oil that accumulated. While looking at this view of the camera, I want to point out a change in neck strap attachment design. Prior to the M5 and M6, all of Canon's EOS camera neck straps threaded through a wide loop on top of the camera. The M5 and M6 utilize a U-shaped wire that attaches to the neck strap with a plastic piece locking the connection in place. All of Canon's interchangeable lens cameras feature easy-to-use, logically-laid-out menu systems. A series of tabbed menus are especially quickly accessed using the touch screen and the My Menu provides a customizable list of frequently used options. 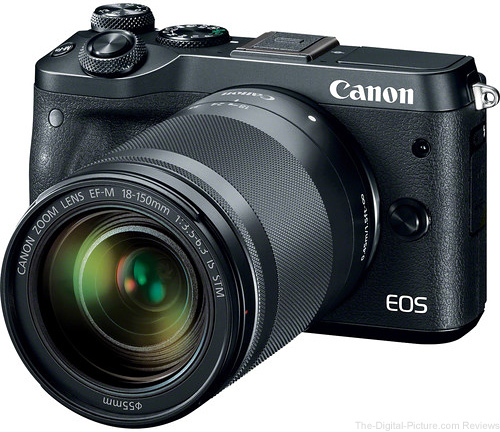 On the top of the camera, there are three significant changes compared to the EOS M3. Can you spot the differences? Two are easy to find while the other is not as easy to spot from this angle. The camera product images comparison tool allows comparison of many additional Canon EOS models. Like the M3, the M6 has a mode dial and a dedicated exposure compensation on the right side. A pop-up flash occupies the left side. One easy-to-see significant change from the EOS M3 is the new power switch, located just below the compensation dial. The button on the older M models was not my favorite, but the switch is much better, providing immediate and sure determination of the power setting. The other obvious difference is that the M6's microphone ports are located on the top of the camera, whereas the M3's are located on the front of the camera near the lens mount. The not-so-easy-to-spot change is the stacked quick control dial. This dial protrudes outward from just below the exposure compensation button. While two dials in the same location may sound like a complication, they are both easy to use and ideally positioned for thumb access. I programmed my quick control dial for ISO settings, making this much-used setting available at my fingertip. The M6 has a full set of shooting modes, ranging from crazy-easy point-and-shoot and smart to fully manual with most everything in between covered including a wide range of special effects that can be applied while shooting. Hybrid Auto Mode (the other green mode) creates a short digest movie of the day by recording 2-4 second clips before each still image capture. Canon has not released official pictures showing the M6 from the sides, but the M6 appears nearly identical to the M5 shown in the comparison below with a pop-up flash switch located just above the ports. The port cover of the M6 is textured to match the camera's grip surface, similar to the M5. Opening the flexible port cover exposes the A/V digital out (still the slower USB 2.0 standard) and microphone ports. The right side of the M6 has a remote release (E3 style, not N3), HDMI port and a Wi-Fi button. The memory card slot, found on the side of larger DSLR cameras, actually resides on the bottom of the M6 in the battery compartment. Certainly you've been taking notice to how small this camera is relative to the non-M series models being compared above. Small size and light weight are hallmarks of the entire EOS M series. As you can see from above, the EOS M6 is basically the same size as the M3 but 0.9 oz (25.5g) heavier. The EOS M and M10 are the smallest, but they have very little grip surface. When the absolute smallest option is needed, these models may be the best choice. However, the increased grip size found on the M6, M5 and M3 make these cameras much easier to hold onto and, if much time is spent with the camera in hand, these models are a better choice for this reason alone. The additional controls these models provide are further reason to take the modest size hit. All models in the entire current Canon EOS line (and most discontinued models as well) feature very nice build quality and even the least expensive models appear this way. Construction is tight with dials and buttons that assuredly click affirmation of use. As usual for EOS models, Canon has ergonomically rounded most of the camera and especially the areas intended to be gripped are void of sharp corners. Unless the retro look is what you are going for, you will likely find this design aesthetically pleasing and kind to your hands. That said, the silver and black model does have a retro appearance. I don't remember ever dropping a camera outside of a case but ... I can no longer say that. The M5 was on my desk and its neck strap (yes, they are sometimes a liability) caught on the leg lock thumbscrew on the bottom of my Really Right Stuff Ground Level Tripod as I went to put it away. The M5 was pulled off of my desk and there was nothing I could do but watch it land solidly on the concrete floor. While I suffered a bit of psychological damage, there was no noticeable damage to the camera. I don't advise trying this test at home just to prove me right, but there is not even a mark on the M5 and no effect on image quality was noticed. Then I began breathing again. The EOS M6's build quality closely mirrors that of the M5. Like many of Canon's recently released EOS model, the M6 has built-in Wi-Fi and NFC (Near Field Communications). Unlike most EOS models released to date, the M6 also has Bluetooth low energy wireless technology included. These technologies provide easy transfer of images and movies to compatible devices. Transfer images and movies to smartphones and tablets, to web services such as Canon's Image Gateway, to media players such as DLNA-compatible TVs, to PictBridge-compatible printers, to the Canon Connect Station CS100 photo and video storage and sharing device or send them directly to another Canon Wi-Fi-compatible camera. Smartphone and tablets connect using Canon's free Camera Connect app. In addition to transferring movies and still images, this app provides some remote camera control features and provides a live view display of the scene. Camera Connect has a lot of untapped potential with the current feature set being somewhat basic. Bluetooth is a new EOS technology feature. However, Bluetooth alone on the M6 is only useful as a wireless remote release using Canon Camera Connect, simply initiating a still photo capture or starting and stopping movie recording. Attempting to access the other Canon Camera Connect App options, including image transfer, initiates a Wi-Fi connection. Now common is for Canon's latest EOS DSLRs to feature built in RAW conversion to JPG, complete with many adjustments available for doing so and the M6 once again supports this feature. While shooting in RAW format insures the highest image quality, this file format is not so welcomed by many of the wirelessly-connected devices. With built-in RAW conversion, you can photograph in RAW format, create a JPG file and then wirelessly transfer it. Note that this camera does not feature a built-in GPS. The Canon Connect App is able to serve as a GPS logger, though battery drain will be high on the logging device. While the M5 and M6 do not directly support the Canon GP-E2 GPS Receiver, the GP-E2's logging function can be used to geotag images later (accuracy depends on the camera's date and time being accurately set). 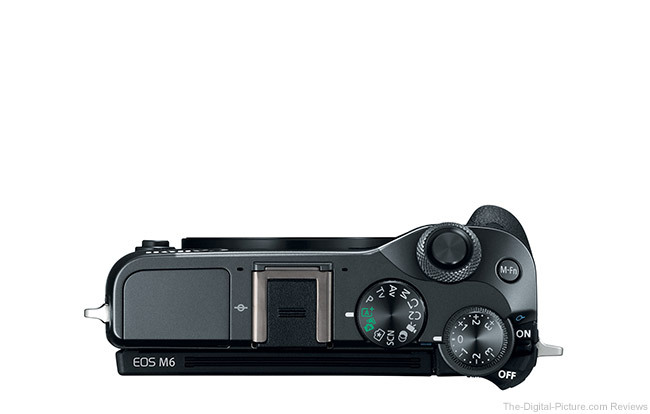 The EOS M6 has a self-cleaning sensor system, referred to as the EOS integrated cleaning system. I dislike imaging sensor dust greatly and similarly dislike cleaning imaging sensors. That the EOS integrated cleaning system typically performs its job very well and keeps the sensor clean is a time-saving asset. If cleaning is needed, the lens can simply be removed and, without a mirror or shutter in the way and with a shallow lens mount depth, the imaging sensor is right there, easily accessible for cleaning. The M6 utilizes the LP-E17 lithium ion battery pack, the same battery shipping with EOS M3, M5, Rebel T7i and 77D. This battery is quite small, light and convenient. But, in a mirrorless camera, this battery's approx. 295 shots rating (or approx. 290 shots when used with the EVF-DC2) is unlikely to impress you. When shooting the indoor track meet mentioned earlier with the EOS M5 featuring the same battery and battery life spec, I nearly drained a battery during the 1,500m event alone. There are many factors that affect battery life (including drive mode, flash use and temperature), but enabling the M6's Eco Mode extends the rating to 425 shots. The key is to take enough charged batteries with you to satisfy your needs (and keep an eye on the 4-step battery level indicator to make sure the battery change happens at a convenient time). The M6's battery slot is not keyed to stop incorrect insertion until the battery is nearly fully seated. Just because the battery goes into the slot does not mean that it will fully click into place. While I can easily determine that the contacts side goes in first, the other two options are not as easily determined between. If an electrical outlet is available, the Canon CA-PS700 AC Adapter will provide continuous power to the M6. When you buy a Canon EOS camera, you are buying into an incredible family of lenses, flashes and other accessories. The camera body (or multiple bodies) is the base your system is built on and a lens is the next essential piece of kit. 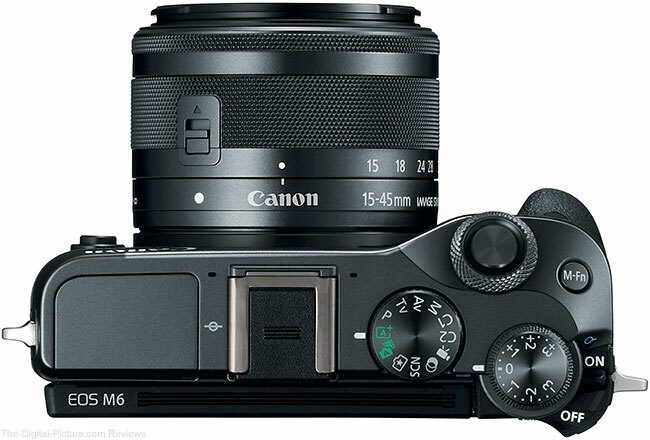 The Canon EOS M6 is available as a body-only kit, in a kit with the very small Canon EF-M 15-45mm f/3.5-6.3 IS STM Lens as seen above or in a kit with the modestly larger Canon EF-M 18-150mm f/3.5-6.3 IS STM Lens as seen below. Those opting to purchase the M6 are likely choosing it in part because of its great image quality and small size. To realize the great image quality requires a high quality lens. The APS-C image sensor is large and large imaging sensors require a large image circle to cover them. This means that lenses, at least those with wide apertures, may not be able to scale down relative to this camera's size. Canon's EF-M Lenses are very compact and they are all good choices for this camera. My M5 came with the EF-M 15-45 and I opted for the EF-M 18-150 with the M6. I appreciated the 15-45 lens' smaller retracted size and wider angle of view compared to the EF-M 18-55mm lenses I have on my M and M3 and the focal length range of the 18-150 is really nice. To remain as similarly compact as the M cameras, the currently available EF-M lenses have narrow max apertures with one exception – the Canon EF-M 22mm f/2 STM Lens pancake-style lens. Via the EF-EOS M Adapter, all of Canon lenses (EF-S, EF, TS-E and MP-E) can be mounted on all of the M models. While only a small percentage of these lenses retain the small size and light weight spirit of the Ms, having them available is a big asset, especially for those already having (or planning to have) a larger EOS model in their kits. High on my list of recommended accessories for the EOS M6 is the Canon EVF-DC2 Electronic Viewfinder. I reviewed this viewfinder along with the M6 and found it invaluable, especially when photographing under bright conditions. The EVF-DC2 EVF features diopter adjustment, meaning it can be focused to the needs of your eye. A button on the right side switches the EVF between off and auto mode where the proximity detector automatically switches between the camera's rear LCD and the EVF based on the presence of an eye (or something else). The round eyecup is comfortable, the EVF provides a nice amount of nose relief from the rear LCD and the quality of the image presented is very good. 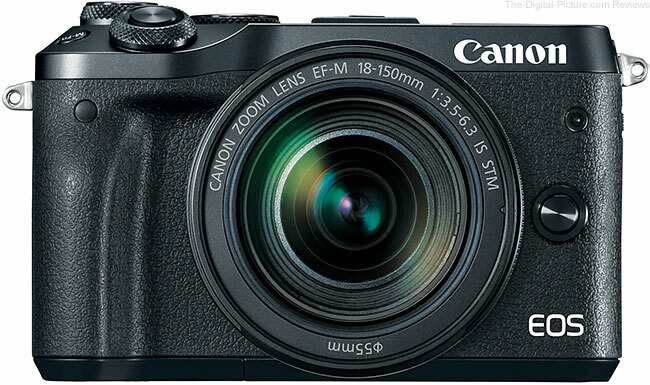 The Canon EOS M6 is compatible with the small, inexpensive Canon wireless remotes including the Canon RC-6 Wireless Remote. Want to be part of your own family picture? Or just don't want to deal with a remote release cord or Bluetooth/Wi-Fi? This may be the accessory you want. The EOS M6 is also compatible with Canon's E3 wired remote releases and, with an adapter, the Canon Timer Remote Controller TC-80N3. Browse the reviews section of the site to find many more compatible accessories including flash systems, tripods & heads and much more. The M6 falls just below the flagship EOS M5 and its price reflects this status. 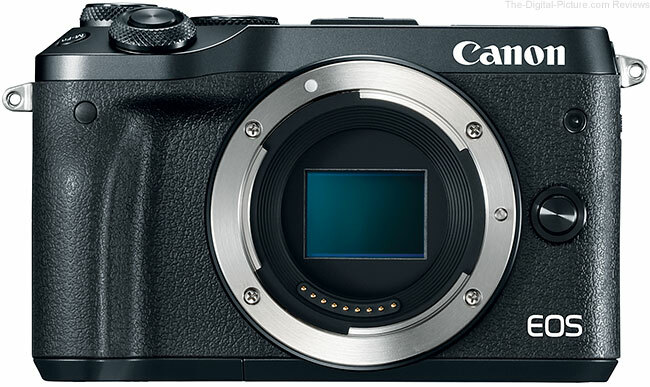 Though it is a full-featured camera that performs extremely well, it is priced toward the bottom of the EOS range with a moderate price. Compare the M6 to similarly equipped DSLRs such as the 80D and it begins to appear as a bargain. Reviewing one of the feature-filled EOS cameras currently hitting the streets is a daunting, time-consuming effort. One could write many books about using this camera and getting the most from it. Hopefully I've given you the basics needed for decision making. To dig deeper into this camera's capabilities, I recommend reading the owner's manual (a link to the owner's manual appears at the beginning of this review). I know, there are a LOT of pages in the manual, but ... the pages are small in size with big print. The manual will tell you all about a huge array of features not even mentioned in this review – including lens aberration correction. Owning a Canon product gives you access to Canon support and the support I have been provided by Canon's USA division is excellent (sorry, I have no experience with the other Canon divisions). When I call for support, I get an intelligent person who sincerely wants to help me with whatever my question or problem is (I do give them challenges sometimes). Canon repair service, though I seldom need it, is very fast and reliable. 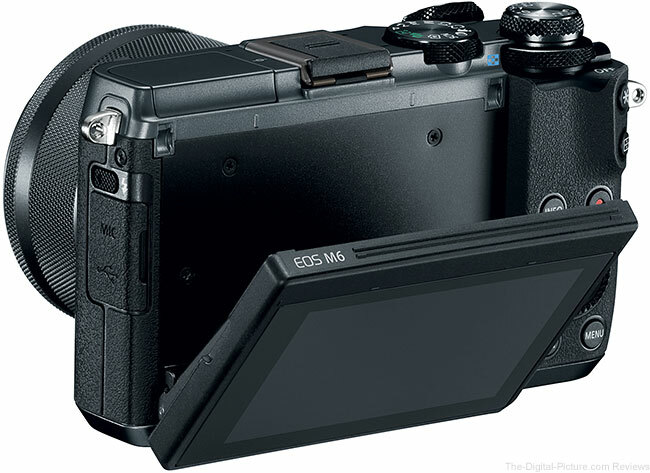 The EOS M6 used for this review was purchased online retail-supplied. Is the EOS M6 the right camera for you? That is always a question to answer in a review and, yes, this camera very well could be right for you. But, alternatives should always be considered. That was easy. These two cameras are very similar and the decision for most comes down to those 5 factors. I would rather have the M5, but if the EVF is not going to be useful to you, the M6 may make more sense. While these cameras are quite different in many regards, they are surprisingly similar in their capabilities. If you have been waiting to jump into a Canon MILC and an APS-C sensor format works for you, the EOS M6 should be a great choice. While one may feel a tendency to treat a camera of this size as a point and shoot model, using it only for those still-important snapshot opportunities that pop up (it works extremely well for these) would mean underutilizing a highly-capable camera. The M6 has an excellent AF system (intelligent, quickly controllable and good speed) and an impressive set of features and controls. While a complete beginner can employ this camera to capture high quality images with little effort, the advanced user who takes the time to learn this camera's features will have great control over their imagery. Whether it is tucked into a pocket or in camera case for backup purposes or used as a primary camera, the M6 is a little camera that deserves some serious attention. Should I Get the Canon EOS M6 or the EOS M50 Mirrorless Camera?